Plastic caps offered by us are widely used for manufacturing different types of parts from thermoplastic as well as thermosetting plastic. Molds are developed using high quality raw material such as steel or aluminum, sourced from the trusted vendors of the market. Quality of these products are checked on certain well-defined standards, before their dispatch to the clients' end. Our range includes Plastic Caps, which is available in standard as well as customized forms. We also offer wide range of Plastic Caps. Our company is placed among the foremost manufacturer, trader, distributor and supplier of Injection Plastic Caps. Our adept professionals only use superior quality plastic and cutting edge technology to manufacture these caps. The offered caps are availed in diversified sizes and designs to cater the demands of our valuable clients. In addition to this, these caps are known for their features like light-weight and dimensional accuracy. 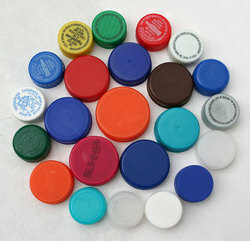 With enriched industrial experience and knowledge, we are providing an excellent range of Plastic Caps. Designed with high precision, these caps are manufactured by using the finest quality plastic and modern technology by our adroit professionals. Apart from this, these caps undergo various tests by our quality examiners so as to ensure their flawlessness. Clients can avail these caps from us at market leading prices.